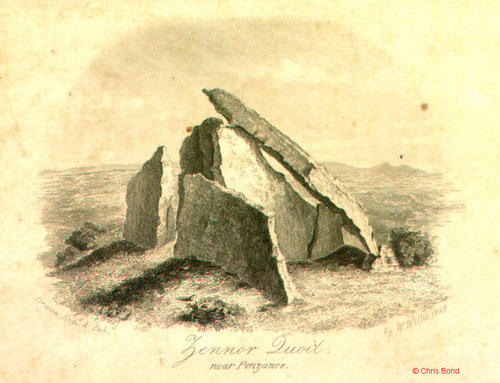 This illustration, which is taken from Cyrus Redding's An Illustrated Itinerary of the County of Cornwall, is, in all likelihood, directly copied from William Borlase's sketch of Zennor Quoit, which appeared in his Observations on the Antiquities, Historical and Monumental, of the County of Cornwall of 1754. The sketch shows the chambered tomb with the capstone still in its original position. The quoit is unusual in that, like that at Trethevy, it contains an antechamber alongside the larger burial chamber. 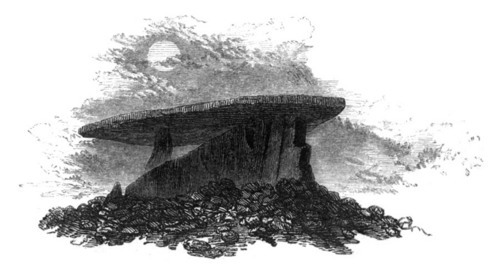 A rare and surprisingly accurate engraving showing the large chambered tomb after the capstone had slipped, but before a farmer was reported to have removed a part of one of the uprights to make part of a cattle shed in 1861. J H Matthews quotes the Cornish Telegraph of September 4th of that year: "Zennor Quoit, one of our local antiquities, has recently had a narrow escape. It consists of seven stones, one of which is a large granite slab which lies in a slanting position against the tallest of the uprights. A farmer had removed a part of one of the upright pillars, and drilled a hole into the slanting quoit in order to erect a cattle-shed, when news of the vandalism reached the ears of the Rev. W. Borlase, vicar of Zennor, and for five shillings the work of destruction was stayed, the vicar having thus strengthened the legend that the quoit cannot be removed. "1 This view of 1849 shows the tomb very much as it appears today, and thankfully the amount of damage done to the cromlech was minimal. This view does, however, disprove the notion that the said farmer’s actions had caused the collapse of the 9.3 ton capstone. According to James Dyer an unsuccessful attempt to open the tomb with gunpowder was made sometime in the 19th century and this may have caused the collapse of the capstone.2 © Chris Bond - Private Collection. 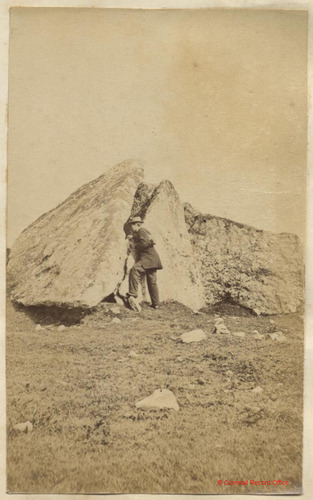 A mid-Victorian photographic view of Zennor Quoit illustrating the relative size of the left hand upright at the front of the cromlech on the right hand side of this image. William Copeland Borlase, writing in Nænia Cornubiæ of the appearance of the monument in the time of William Borlase, ponders that "In all probability it had been freshly disinterred from its cairn, or rather the gigantic structure had just succeeded in shaking off, or piercing up through, the crust of loose dèbris which had been piled over it; for in the last century, "a stone barrow, fourteen yards in diameter, was heaped round it, and almost reached to the edge of the quoit." Care had been taken, however, in the erection, that no stone should get into the chamber, and it was with great difficulty that a man could squeeze himself into it." A thought, no doubt, which might also have crossed the mind of the gentleman shown in this photograph. Image courtesy of and © Cornwall Record Office. 1. Matthews, John Hobson. 1892. A History of the Parishes of Saint Ives, Lelant, Towednack and Zennor. Elliot Stock. 2. Dyer, James. 1982. The Penguin Guide to Prehistoric England and Wales. Penguin (Originally Allen Lane, 1981).